A quality little mini-motherboard capable of making up the heart of a very powerful gaming monster. Good lord, that's a striking mobo. It's also a pretty impressively performing board too, built for the new generation of processor from Intel, the 4th Generation Core architecture, previously code-named Haswell. It's also one of the first boards I've looked at outside of the expensive Intel own brand mobo that was shipped me with the inaugural i7 Haswell review CPU. 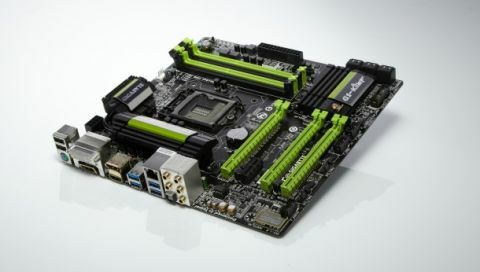 The most obvious thing about this board is its micro ATX form factor, but don't for one second think that has an impact on the performance you can get out of this mean, grean motherboard. It may be small, but don't let that fool you - it was able to keep pace with a similarly impressive, full-size Asus Z87-Pro board. It's got a host of functionality too, housing a full complement of SATA 6Gbps and USB 3.0 ports, as well as support for both sides of the multi-GPU battle, in SLI and CrossFireX. It's the full Z87 motherload, in other words. There are other things that mark it out as a gaming board, aside from the aggressive skull and blade motif on the component cooling block. The key one being the attention Gigabyte has paid to the on-board audio. They have physically separated out the section of PCB that houses the Creative Sound Core audio, marked out by a green-lit divide when the board's powered. That separation enables them to minimise the amount of noise/interference you often get with on-board audio, especially through headphones. Another key pointer is the fact it's got swappable operational amplifier (op-amp) chips. I'm pretty sure this is normally a feature you only get with high-end PC audio cards, so to have the option to swap out different chips to fine-tune the sound is impressive. You get two different chips with the board - one for more neutral sound and another with 'softness of touching', which apparently makes it suitable for orchestral sound. You can also pick up another three chips in a separate op-amp upgrade kit, should you feel the need. As for performance the G1. Sniper M5 is every bit as good as the other boards I've checked out, offering top-end overclocking chops from my 4770K engineering sample. I managed a decent 4.7GHz top speed with the Gigabyte board, a figure matched by the also impressive Asus Z87-Pro. The board Intel shipped with the chip itself, on the other hand, could only just about hit 4.5GHz, though the Intel board did perform slightly better at stock speeds. But with the retail chips generally offering less overclocking headroom that means this impressive mATX Gigabyte board will still have you covered.